I brought these down to show Alice, and she was running them through her fingers and cackling. "I'm rich in ornaments!" she giggled. So I giggled too. A great concept, being rich in something in particular. These are about 2" across. They still need ribbon hanging loops to make them properly ornamental. 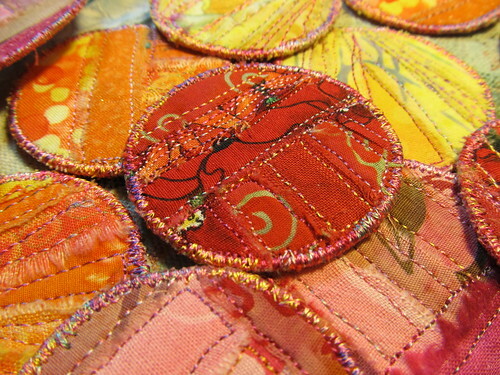 Until they can hang, they are just large fabric coins. Which is a nice enough concept, but hard to keep on a Christmas tree. Because Aerin was home sick today I got to spend some quality time with the computer updating things. As a direct result of that, the Bigcartel link (above, see Large Works For Sale) has something in it. The reproductions of the pond pictures are there. If the chicken originals don't sell at the craft show, then I'll post them there as well. The cards will go on Etsy. If you click on the grid of things on the left there, it should take you to the Etsy store. Alternatively, there is a button on the top bar (Cards and Small Works) that will take you there as well.